This week's outfit is something I would (and have) worn to work. I work in a very relaxed environment where it's OK for me to be business casual. Who am I kidding? Casual casual is fine, too! 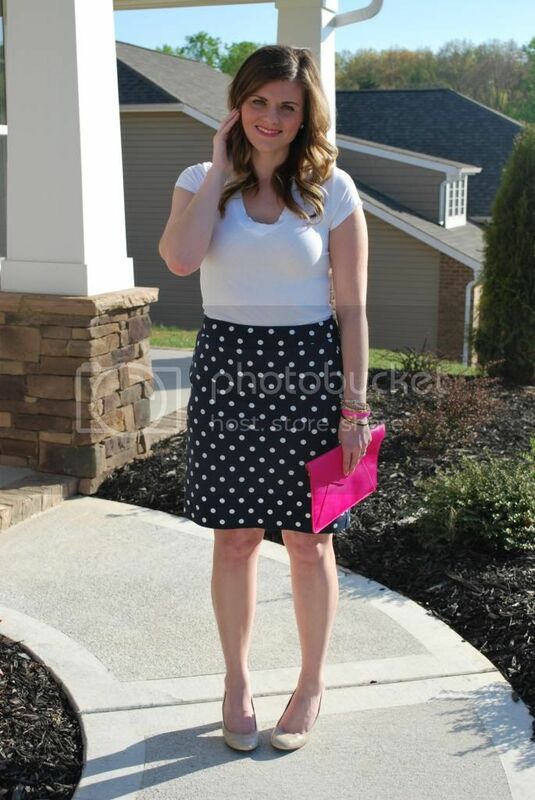 I like that the skirt has a classic silhouette in a trendy polka dot print. I think a pencil skirt is flattering on a woman's body, but sometimes they can feel old. This definitely feels sophisticated, but young. I'm linking up here and here! Hi Jessica. I am Ada. I just found your blog and my first time linking up. I am glad I did. I am loving today's outfit, so simple yet chic. I have pieces like yours in my closet, including a Bright Pink Clutch, so I am going to re-create it soon. Love the clutch & bracelets by the way. Consider me your Newest Fan & Follower. Please stop by my blog, check it out & would love your support too by following me back. Also, I am running some exciting things for May - My Birthday Month, see if you might be interested. 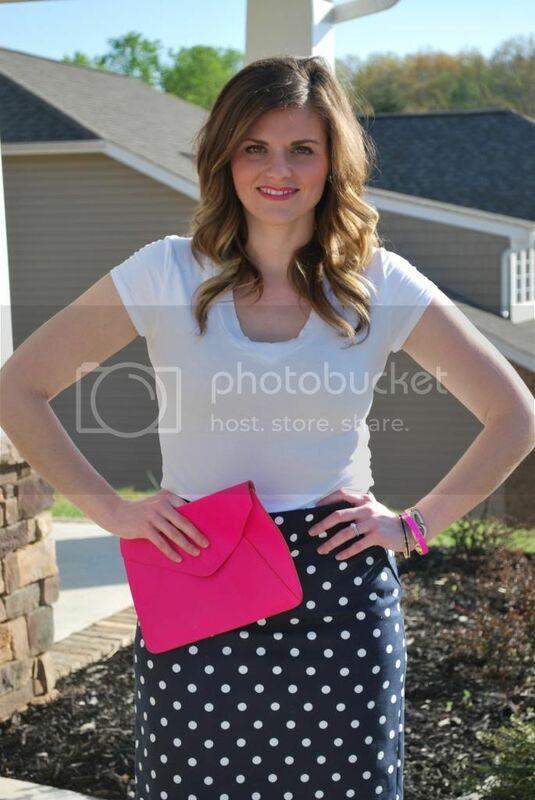 I love the skirt with the hot pink clutch, very chic indeed! This is so pretty! I love the pop of pink! Loving your look! 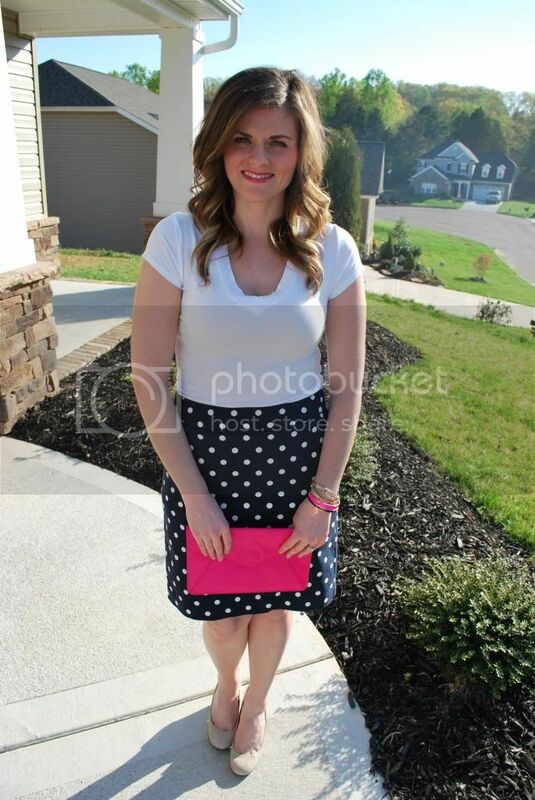 Your polka dot skirt and pink clutch are too cute! You are so right, the fun polka dots make that skirt more youthful than a straight up plain one. It doesn't feel corporate at all! I just found your blog through the Style Sessions link-up and it love it! I almost bought that same skirt from Target but it was too small. Boo! Great outfit. I think it just goes to show that the simplest things (a plain white tee) can look fantastic when you have the right fit!